In software development, testing is paramount. So why should I do it, you ask? Tests act as documentation for your code! The best way to do code testing is by using Test-Driven Development (TDD). Then, run the test – The test should fail, since there&apos;s no code to make it pass. Being a fan of best practices, we are going to use TDD to create a bucketlist API. The API will have CRUD (Create, Read, Update, Delete) and authentication capabilities. Let&apos;s get to it then! The aim of this article is to help you learn awesome stuff while creating new things. We&apos;ll be creating a bucket list API. If you haven&apos;t heard about the term bucket list, it is a list of all the goals you want to achieve, dreams you want to fulfill and life experiences you desire to experience before you die (or hit the bucket). This API should therefore help us to create and manage our bucketlists. If you haven&apos;t done any Django, Check out Building your first django application. It&apos;s an excellent resource for beginners. Now that we know about a bucketlist, here&apos;s a bit about the tools we&apos;ll use to create it&apos;s app. 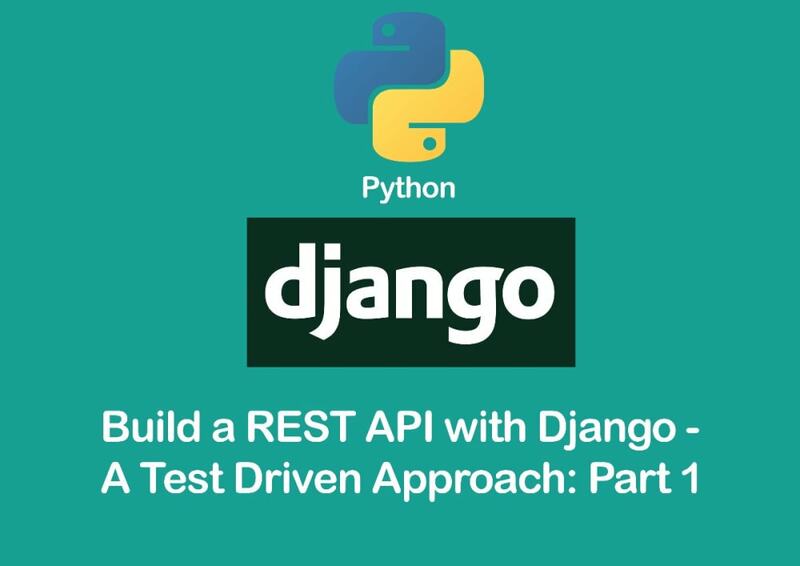 Django Rest Framework (or simply DRF) is a powerful module for building web APIs. It&apos;s very easy to build model-backed APIs that have authentication policies and are browsable. Authentication – From basic and session-based authentication to token-based and Oauth2 capabilities, DRF is king. Serialization – It supports both ORM and Non-ORM data sources and seemlessly integrates with your database. Heroku, Mozilla, Red Hat, and Eventbrite are among the top companies using DRF in their APIs. Create and cd into your project folder. You can call the folder anything you like. Then, create a virtual environment to isolate our code from the rest of the system. The -p switch tells virtualenv the path to the python version you want to use. Ensure that you put the correct python installation path after the -p switch. venv is your environment. Even though you can name your environment anything, it&apos;s considered best practice to simply name it venv or env. You will see a prompt with the environment name. i.e (venv). It means the environment is now active. Now we&apos;re ready to install our requirements inside our environment. Since we need to keep track of our requirements, we&apos;ll create a requirements.txt file. Then finally, create a django project. For our app to use DRF, we&apos;ll have to add rest_framework into our settings.py. Let&apos;s go right ahead and do that. In Django, we can create multiple apps that integrate to form one application. An app in django is simply a python package with a bunch of files including the __init__.py file. The startapp command creates a new app. Our app is called api. It will hold our API logic. So far, you should have a folder named api alongside the djangorest app. To integrate our api app with the djangorest main app, we&apos;ll have to add it to our djangorest settings.py. Let&apos;s go right ahead and do that. We&apos;d want to create the models first. But we have no tests written. We&apos;ll therefore write some tests in the tests.py folder of our api app. self.bucketlist_name = "Write world class code"
"""Test the bucketlist model can create a bucketlist.""" The code above imports the test case from django.test. The test case has a single test which tests whether the model can create a bucketlist with a name. You should see a bunch of errors all over the screen. Don&apos;t worry about it. It&apos;s because we haven&apos;t written our model fields and updated our database yet. Django uses SQlite as it&apos;s default database so we&apos;ll use it for now. Also, we don&apos;t have to write a single SQL statement when creating the models. Django handles all that for us. In the models.py we&apos;ll define fields that will represent the table fields in our database. Serializers serialize and deserialize data. So what&apos;s all this about, you ask? Serializing is changing the data from complex querysets from the DB to a form of data we can understand, like JSON or XML. Deserializing is reverting this process after validating the data we want to save to the DB. """Meta class to map serializer&apos;s fields with the model fields.""" This test fails when we run it. This is ok. It happens so because we haven&apos;t implemented the views and urls for handling the POST request. """This class defines the create behavior of our rest api.""" Notice we specifed the queryset and serializer_class attributes. We also declare a perform_create method that aids in saving a new bucketlist once posted. For it to be complete, we&apos;ll specify URLs as endpoints for consuming our API. Think of URLs as an interface to the outside world. If someone wants to interact with our web API, they&apos;ll have to use our URL. Create a urls.py file on the api directory. This is where we define our url patterns. The format_suffix_pattern allows us to specify the data format (raw json or even html) when we use the URLs. It appends the format to be used to every URL in the pattern. You should see this output on your console That means everything is running smoothly. """This class handles the http GET, PUT and DELETE requests.""" RetrieveUpdateDestroyAPIView is a generic view that provides GET(one), PUT, PATCH and DELETE method handlers. Finally, we create this new url to be associated with our DetailsView. Enter the specified URL (http://127.0.0.1:8000/bucketlists/1/) in your browser. And voila! – It works! You can now edit the existing bucketlist. Phew! Congratulations for making it to the end of this article – You are awesome! In Part 2 of the Series, we&apos;ll delve into adding users, integrating authorization and authentication, documenting the API and adding more refined tests. Want to dig deeper? Feel free to read more of DRF&apos;s Official Documentation. And if you&apos;re new to Django, I find Django For Beginners Excellent. A full-stack software engineer, Jee believes in doing it today, not tomorrow. He enjoys gaming, lively hangouts with friends and family, and when away – the quest for rare coins.